We know how difficult it is to open and manage a company in a foreign country. We know how much any business relies on a helpful and complex service. We know Hungarian tax and accounting regulations. Our references are the proof of our expertise, reliability and our high quality accountancy service. We do not simply give promises but also invest in keeping our client’s book keeping and taxation faultless and up-to-date. To guarantee this, we have millions-worth liability insurance, a membership in the Tax Advisors’ Board, state-of-the-art book keeping programmes and numerous subscriptions to journals and books in the field of taxation. Our staff receives regular training to ensure up-to-date, expert knowledge. Precision, reliability, up-to-date knowledge in the field of accountancy. Our main goal is to provide our clients with all the care they need to make business operations run smoothly. Balance sheets, company representation at authorities, tax returns, continuous contact. Keeping in mind that Hungary is totally new for you! No company can operate without tax planning and optimisation these days. New tax types are introduced, taxation is getting more complicated, therefore, getting an overall picture about the full tax system is almost impossible. Without expertise, conscientious attitude and continuous training, filing taxes might resemble a jump off a cliff. We are here to help you. Feel free to appeal to us in accounting and bookkeping questions. Vállalkozását teljes egészében nézzük, egyedi igényeik szerint optimalizáljuk pénzügyeiket. Naprakész tudással és felelősségvállalással végezzük cége könyvelését, adótanácsadását. Egyedi igényei szerint, alapos konzultációk alapján dolgozzuk ki az Ön számára legideálisabb megoldást. Odafigyeléssel és precizitással végezzük el a ránk bízott pénzügyi feladatokat, maximális szaktudással. Choose quality service – invest for the long term! No business can afford to have its accounting done in a haphazard manner. 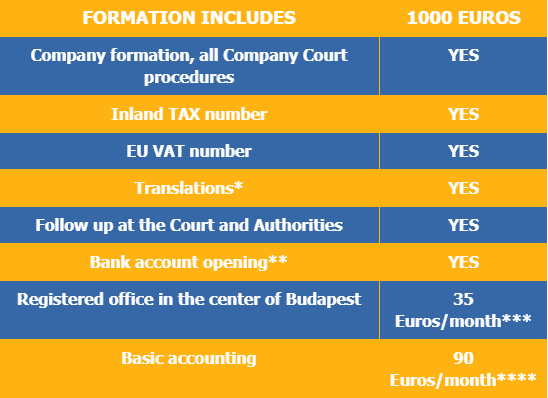 The recent years have brought about major changes in the tax system of Hungary, including the complete reformation of the Hungarian tax authority, which operates with more efficient control tools now. Furthermore, any fault when filing your taxes is considered an equally serious offence as intentional tax evasion. We need to be clear about this: in the present circumstances it’s only well trained, conscientious professionals – able to read and interpret laws – who can ensure the proper bookkeeping and taxation of your company. Admiral-Count Ltd. has been working in the field of accountancy since 2005, offering bookkeeping services for small and medium sized enterprises with maximum client satisfaction. Whether you are about to found a new company or simply looking for a new accountant instead of the present one, we are glad to offer our services: if we trust ourselves – you can trust us as well. 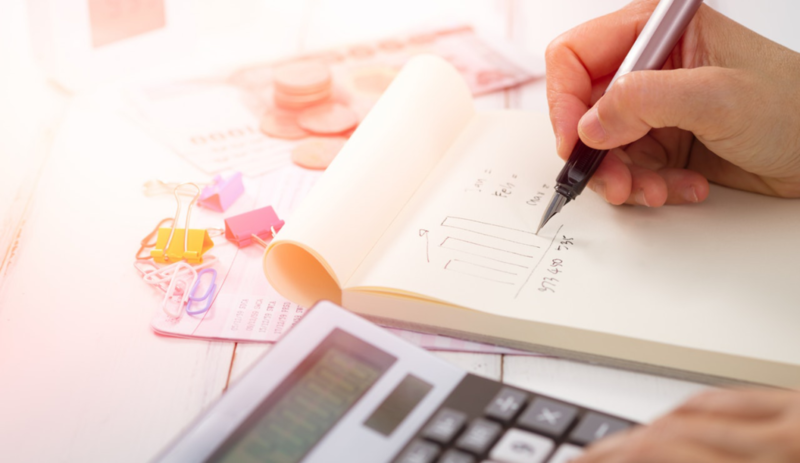 Active participants of business life and leaders of companies that wish to adapt to current market trends have high expectations regarding the bookkeeping of their enterprise. It is vital to understand that bookkeeping as such can not exist solely in the classical meaning of the word. Administrating and “keeping” something is not enough any more, it is development that drives a successful business. Taxation as such is in constant change, tax laws are modified several times a year, which requires of our professionals to follow the latest laws and regulations, adapt, learn and develop their knowledge. Only someone with a Chartered Tax Adviser qualification is entitled to work in the field of tax consultancy. Don’t take a risk! Bring your taxation matters to us! A responsible leader needs a clear picture about the company’s future prospects: profits, costs and cost types, projected income and income types, tax types. Furthermore, he needs ideas, advice and strategy. Co-operation with an accountant requires a strong business relationship. We do not wait till May- the deadline for filing annual tax reports – we do quarterly reports instead. In Hungary the easiest/cheapest/fastest way for owning a company if one establishes a new one. Company will have Company Court registration number, Tax and EU VAT numbers immediately. In case if director can come to Budapest to sign the documents personally you can get the company on your name with registered seat and bank account in 3-5 days. in Hungary Company Court registers and publishes TAX numbers and EU VAT numbers together with company registration – within 3-5 woking days! *The fee includes translations in case of Sole Owner company. In other share-owning constructions additional fee can be charged. Ask for details! 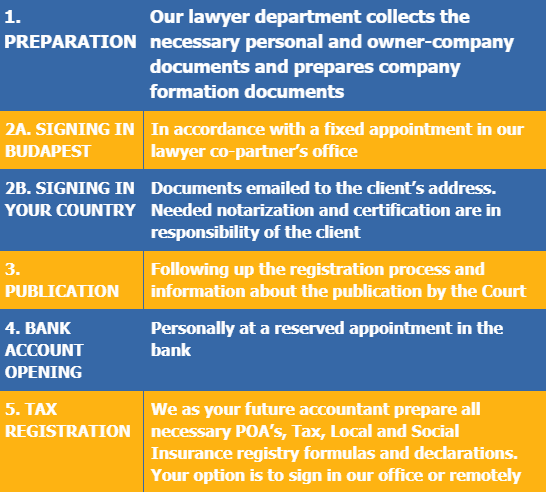 Besides accounting we collaborate with our lawyer and other provider partners in company formation, registered seat, virtual office, social insurance card managing, bank account opening, VAT-refunds, accomodation service. Admiral-Count Ltd handles the audit of companies in co-operation with a reliable auditor. Should you need an appointed auditor to carry out audit for your company, please do not hesitate to contact us. Before you contact our lawyer partner to make company formation, we recommend a free personal meeting in our office. 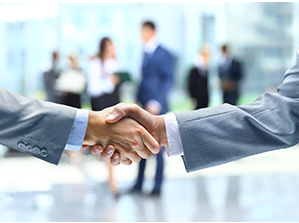 We can discuss all the parameters necessary for a secure start of your company. What does the term involve? First of all, revealing the company’s taxation matters in details before an audit from the tax authority. Investors might find due diligence just as useful before a company take over. We forward the tax reclamation sheets to the foreign tax authorities via the Hungarian tax authority, whereon the amount of the VAT paid abroad will be transfered to the client’s bank account. It is legally possible to operate a company anywhere in the EU, however this freedom was not followed by tax-law harmonisations. It involves a very special, country specific company law, taxation rules and bookkeeping requirements. Cégünk szakmai felelősségbiztosítással rendelkezik a Generali Biztosítónál. Könyvelési szerződésünkben és ÁSZF-ünkben tételesen szabályozásra került felelősségvállalásunk. Garanciát vállalunk munkánkra, hogy ügyfeleinket ne érhesse hátrány.